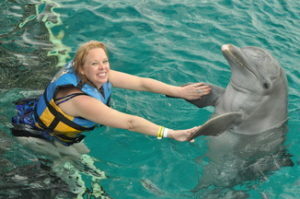 Home » Articles » A Unique Energy Medicine Experience My First Energy Session was with a Dolphin! I have been working in Eden Energy Medicine since I was young, but over the last 17 years, I began working beside my mother, Donna Eden, in her international workshops and am on the faculty of the Eden Energy Medicine Certification Program (EEMCP). As many in the community know, I don’t treat people in Energy Medicine as a profession, although I know how to energy track and intuitively feel where I am supposed to go. This comes easy for me, but as I am extremely sensitive, this can be very dangerous for my own energies and so I work Eden Energy Medicine in my own way. I am Donna Eden’s daughter after all and have the healing genes in my blood. I believe I heal through my own art of Energy Medicine dancing, storytelling and teaching children, and intuitive Life Color Readings. I’ve always thought art and entertainment are among the greatest forms of healing and can move us out of and through, emotions and stress very quickly, by turning on radiant circuits. So, I will always be a “Social Healing Artist”. I never realized that I would be “energy working” with anyone beyond my own family and friends, but when the opportunity came up for Kim Wedman and I to work with a sick dolphin in my mother’s absence, I couldn’t pass it up. In 2002, we had just ended our week-long workshop/retreat on Isla Mujeres, the Island of Women, which is full of magic, beauty and amazing synchronicities. We had an incredible beginning energy medicine class with very enthusiastic beginners ranging in variety from doctors and surgeons to horse trainers, to compassionate mothers and sons. We even got into pain chasing early on. You may know that my Mom doesn’t usually get into this subject until the second or third class. Whoo-hoo… lucky class! After class was over, my Mother was asked to go and work with a sick dolphin on the island. Some of you may not know that it was while working with dolphins and whales at Sea World (San Diego, California) in the early 60’s, when my Mom first realized she had an intuitive healing gift. 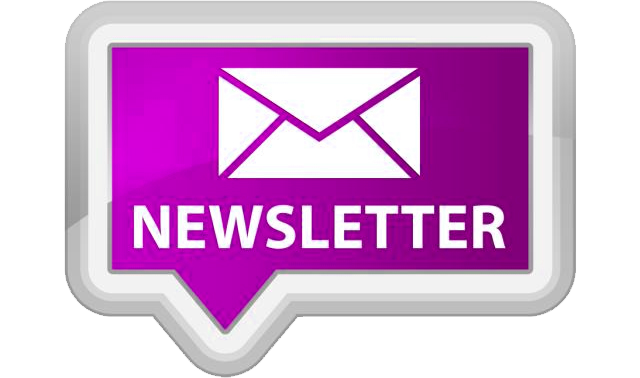 Read my article, “Growing up with Energy Medicine”. Kim and I were staying on the island a bit longer to hang out and relax, so when my Mother couldn’t stay on, we went in her place. 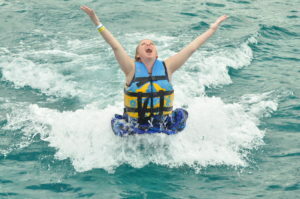 All Kim wanted for her 50th birthday was to swim with the dolphins. So, she fulfilled her lifetime dream and more. What a birthday gift! A few days prior, we consulted my Mom on how to treat a dolphin and transfer energy medicine to him. It obviously didn’t have a human type body, so we’d have to intuit the energy pathways a little differently. She basically told us to do everything you would do for a human, to the dolphin. We set out feeling excited and a little nervous, not really knowing what to expect, wondering if we’d know what to do. We were briefed with this story when we got there. 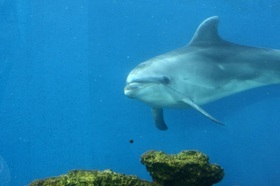 Mikaiko, a Japanese dolphin now living in Mexico, was transported there from his home at an early age going to Guam to Mexico City and then on to Isla Mujeres. He was trained to be an entertaining dolphin that would swim with humans at a water themed park on the island. He had three dolphin friends that he swam and played with in a big pool. Unfortunately, because of disputes between owners and after only two months of being open, it closed for good. The hostility and confusion of the owners and trainers caused the dolphins to be mistreated and neglected. The tank water wasn’t changed and later harsh chemicals (bleach being one of them) were added to the water for cleaning purposes. The dolphins weren’t fed regularly, or even loved. One by one Mikaiko’s friends began to die until only Mikaiko was left. We were told he had developed a skin disease and had itchy skin, maybe because of the chemicals. With this information and a quick look at a skeletal system chart of a dolphin hanging on the office wall, we were educated on the dolphin body. I was intrigued as the skeletal chart showed the dolphin actually has a place where it might have had two short legs, and the tail came around them to form the tail; it reminded me of the mythological mermaid. We also found out that Mikaiko was not his given name, but when healers came in and he wasn’t responding to the Mexican name he was given, they all intuitively came up with this name and he began to gradually respond. Kim and I then, ventured forth to meet Mikaiko. When we first saw him, our hearts sank. Even knowing his story didn’t prepare us for the reality of his energy. This dark blue, almost black dolphin swam with melancholy to see these two new beings. The first thing both Kim and I noticed was his very deep breathing like he was gasping for air. 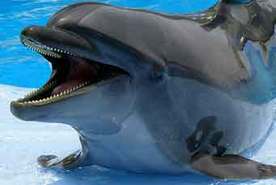 His blowhole seemed extremely large to me. Kim said, “Oh… lungs.” We both said, “Grief… letting go.” Lungs and grief sit on metal element. My Mother later told us that lungs are related to skin problems, which seemed to make sense with Mikaiko. In no time, they invited us into the water for him to get to know us. Kim embraced Mikaiko’s head in her hands and he opened his, usually closed, eyes to look at her. Then Kim and I began to run his meridians. Kim took one side and I took the other. What a sight it must have been to see Kim and I swim down under the water to reach his tail and then come back for air to reach his head. He seemed to take this all in and relaxed into this new feeling. I wonder if he picked up on what we were doing. Imagine trying to find a dolphin’s ears for triple warmer. It is interesting to note that a dolphin’s flippers actually have a whole hand skeleton, from thumb to pinky, to distinguish meridians. We continued to make figure eight patterns on his body and chakra clearing on the big starburst welts that were on his skin. We showed the new trainers how to do this, too. We also did some surrogate testing that seemed to work better with the trainers that were closest to him and that he trusted. We were there a good three hours or more, and by this time Mikaiko began to aggressively swim toward us and threaten to bite, so we knew it was time to stop. The shock of seeing a huge dolphin coming up at your with a mouth open to bite is not a pleasant or normal experience! My Mother later reminded me that the reverse control to metal is wood, so Mikaiko’s agitation and anger coming to the surface of his itchy skin made sense to us. There must have been so much rage, confusion, depression and grief within him to be dealt with so that his radiant energies of dolphin joy couldn’t shine. That night we were literally drained by emotions and the work we were doing. Boy, did that dolphin occupy our bodies, thoughts and hearts that night. We went back to Mikaiko the next day, but he didn’t seem to be having a good day. He was very aggressive and uncooperative. He didn’t want to play or work and the trainers were very frustrated with his progress. Kim mentioned to them that energy moves and if we worked with him the day before, we might have stirred up something in him, whether emotional or toxic. It’s all part of the process and that it may have been a good sign. Mikaiko was also rubbing against the side of the tank to scratch himself. My Mother told me later that itching usually comes when the body is full of toxins. Because we moved energy the day before, toxins were probably coming to the surface wanting to be expelled through his skin and the body needs time to process and metabolize healing work. Sadly, we were not able to go back one last time and check out our suspicion that after two or three days the toxins that we’d stirred up would come out of his body, that he would show that some healing had actually taken place. We wish that my Mother could have seen his energy and colors of his aura to support this. Since this might happen in the future, the trainers later sent photos of Mikaiko to her. We didn’t know for sure how much we accomplished in our healing help, but perhaps we touched beneath the surface and made his anger and stuffed emotions able to move out of him so healing could take place. About a month later we heard the good news that Mikaiko had made a full recovery! He did quite well and was moved to the wonderful dolphin reserve, Dolphin Discovery on Isla Mujeres to heal and connect with other dolphins. They never thought that Mikaiko would be able to be to swim with humans after his dark experience, but lo and behold, they said that he became the friendliest dolphin in the pen. He played with the other dolphins and was one of the most responsive with the staff and tourists there. 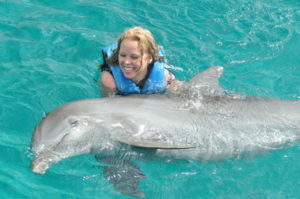 Go visit the dolphin reserve if you are ever in Isla Mujeres and see Mikaiko. Thank you Mikaiko for allowing us the experience of touching your soul. Our lives have been touched as well. We know that Mikaiko was in really good hands, with two women that love him very much. Thank you Lorenna and Alexjandra. Mikaiko, you will remain in our hearts and prayers. I wrote this article years ago, and since then Mikaiko has passed on, but I will never forget this experience. I recently went out to swim with the dolphins at Dolphin Discovery on Cozumel, Mexico with Kim and a few others from our other Energy Medicine Community. It was a wonderful way to find out that I had changed and grown in the last 12 years, since I swam with the dolphins before. I sensed that the dolphins, like horses, could pick up my fear and resistance within myself and I was a bit timid to allow them to pick me up on their noses the first time. Now, with many of life’s lessons behind me, I was flying high, performing “Heaven Rushing In” as they lifted me right out of the water. That first dolphin experience taught me a lot about myself, which was a beautiful gift to conquer within me. Check out the SpeakDolphin website and read about what they’re doing for the healing of marine life of our planet. They help wounded dolphins and marine life, as well as conduct Dolphin communication research, combining Eden Energy Medicine healing work. Donna Brewer Kassewitz, is a member of our Energy Medicine Community and a graduate of our certification program. She and her husband Jack are the founders of this beautiful organization. There is huge controversy right now about dolphins “living in captivity”. Dolphin Discovery is an organization that works with the spirit of the dolphin in a more esoteric and a connective way. 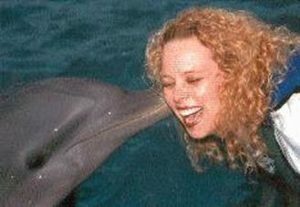 Donna feels that “Dolphins in Human Care” is more appropriate than “dolphins in captivity”. Donna Kassewitz, has written a children’s book about helping the Marine life, due out soon, as well. I later saw on their site that Mikaiko has his own song on a Dolphin music CD, which you can also buy from their site.